Premium quality organic and Fairtrade English Breakfast tea. 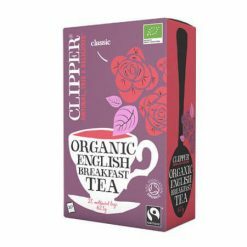 A superior blend of Assam and Ceylon teas with a bright, refreshing flavour, Clipper Organic English Breakfast Tea comes from environmentally integrated tea gardens in north east India’s lush, fertile Brahmaputra Valley and Sri Lanka’s beautiful mountains. Using only natural methods of cultivation with no chemicals, this tea is pure and delicious with a bright, fresh flavour and appearance. It is an excellent tea to enjoy at any time of day. 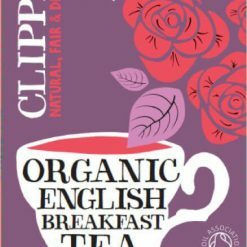 In 1994, Clipper Tea became “t fairtrade tea company. The products contain no artificial ingredients and each teabag is unbleached, as nature intended. Many products are also naturally caffeine-free or, in the case of Assam Blend, caffeineless, having undergone a non-chemical decaffeination using carbon dioxide.